Highly prospective geological terrain with potential for a diverse range of deposit styles. Extensive tenement package held 100% by ActivEX Limited. Historical and modern mining of gold, base metals and uranium. Widespread precious and base metal anomalism. 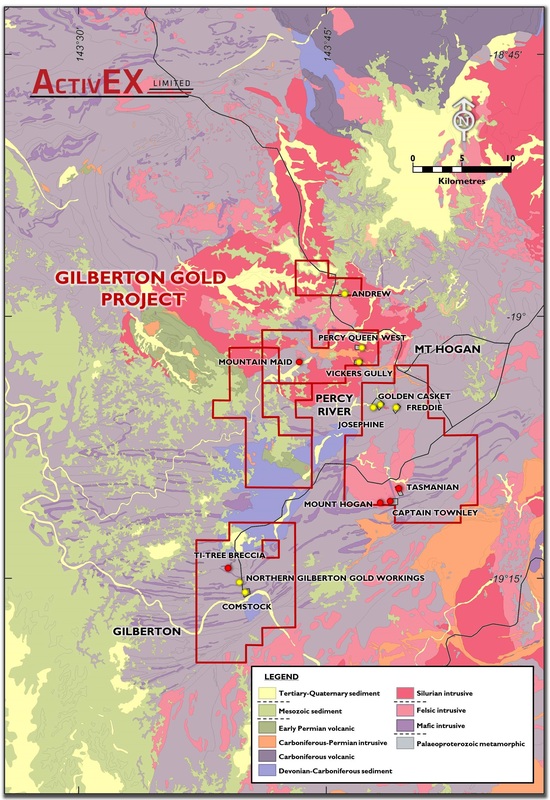 The Gilberton Gold Project consists of EPMs 18615, 18623 and 19207, which comprise a total of 143 sub-blocks and encompass an area of 464 sq. km. The Project is located in the Georgetown Province in northeast Queensland, approximately 300km west-northwest of Townsville. ActivEX Limited holds 100% interest in all the tenements. The Gilberton Gold Project is located in an area that is prospective for a number of metals and a wide range of deposit styles. The world-class Kidston breccia hosted Au-Ag deposit occurs in similar geological terrain approximately 50km to the northeast. High crustal abundance of gold evidenced by numerous hard rock and alluvial Au occurrences. Locally anomalous surface concentrations of other elements, including Cu, Bi, Mo, Pb, U, W, Zn. Multiple centres of alteration associated with veining, brecciation and anomalous metals. Presence of major structural features, e.g. the Gilberton Fault. Permian – Carboniferous intrusions and volcanics. Reactive (calcareous) lithologies in basement units. 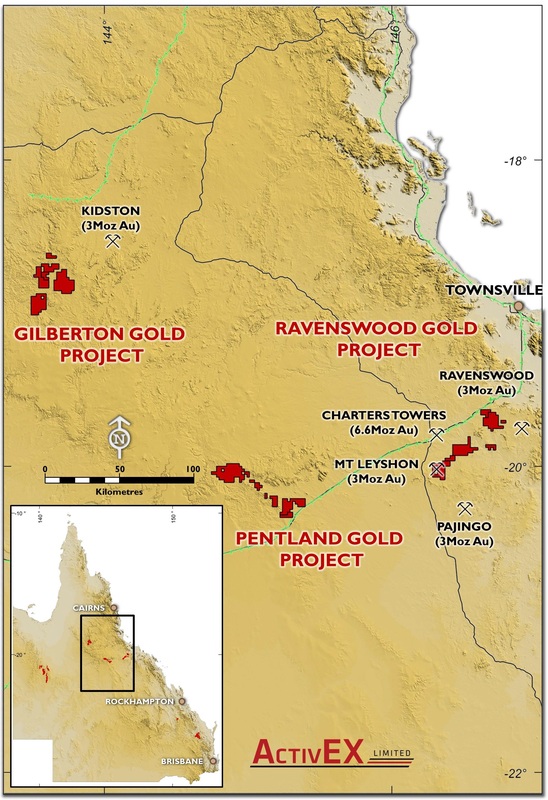 The Gilberton Gold Project is located in northeast Queensland, approximately 300km due west-north west from Townsville, and 450km via sealed and unsealed roads from Townsville. The Project tenements are located in variably undulating and partially cleared cattle grazing land. Access to many areas is good and attained via gravel roads and station tracks. Access to some areas is hindered by rivers and a lack of vehicle tracks. 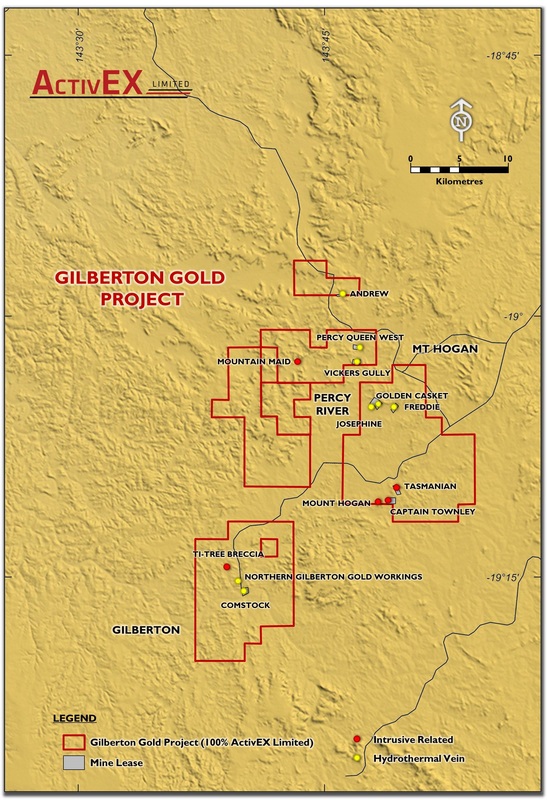 The Gilberton Gold Project is within the area covered by the Gilberton (SE5416) and Georgetown (SE5412) 1:250,000 map sheets, and the Gilberton (7659), Forsayth (7660) 1:100,000 map sheets. The Gilberton Gold Project comprises three granted exploration tenements, EPMs 18615, 18623 and 19207, see Table 1. Numerous companies have carried out surface exploration programs in the Gilberton Gold Project area and several occurrences have had limited (and mainly shallow) drill testing. The most recent exploration in the area was carried out by Newcrest Mining, who conducted extensive grid soil sampling, local ground geophysical surveys, and limited diamond drilling. The most advanced prospect within the tenement area is the Ti-Tree Breccia and nearby breccia-hosted prospects. Newcrest had planned to test this prospect with deep diamond drilling but the company ceased work on the tenement before this was carried out. – Gneiss and schist of the Einasleigh Metamorphics in the north east of EPM 18615 and the southern end of EPM 18623. The Proterozoic, U-anomalous, Mount Hogan granite in the south eastern portion of EPM 18615. Siluro-Devonian Robin Hood Granodiorite in the north of the tenement area. Late Devonian sediments of the Gilberton Formation in two fault-bounded structures in the central portion of the project area, consisting of pebbly coarse sandstone grading to coarse arkosic sandstone and polymict conglomerate. A north-west trending group of Early Permian volcanics considered to be related to the Agate Creek Volcanic Group (basalt, andesite, rhyolite, agglomerate, ignimbrite, and minor interbedded siltstone and air-fall tuff), in the south west of EPM 18615. Carboniferous – Permian intrusive rhyolites as small outcrops associated with the Early Permian Agate Creek Volcanics, and as a more extensive east-west trending intrusion and network of dykes in the north, around the Lower Percy gold field. Mesozoic sandstones and pebble conglomerates, occurring mainly in the north west of the tenement area, and forming dissected plateaux and mesas. The area encompassed by EPM 18623 hosts numerous occurrences of anomalous gold, locally associated with anomalous silver and/or base metals. Several companies have conducted exploration programs within the tenement area; ActivEX exploration activities have comprised a desktop review and reconnaissance traversing and prospect assessment. The main prospect areas within the tenement are summarized below. The Ti Tree (and Black Knob) rhyolite breccia complex comprises two east-west trending, 6.5km long, subparallel zones of flow-banded rhyolite and brecciated rhyolite, within brecciated and calcareous Proterozoic siltstone. The rhyolite breccia is polyphasal and framework-supported, with sub-angular to angular fragments of rhyolite, Proterozoic metasediments and silicified sediments. Breccia matrix alteration consists of a quartz-adularia-specular hematite-ankerite/siderite/calcite ± muscovite assemblage. Abundant specular hematite occurs as veins and infill to the breccia. Quartz stringer and ladder veins occur peripheral to the breccia. The rhyolite breccia complex lies at the interpreted intersection of the Orotava and Ti-Tree lineaments, and is covered by a moderate (2 x background) IP chargeability high, and a partly coincident >l00ppb Au soil anomaly covering a 300m x 150m area. Mineralisation is considered to be related to N-S striking quartz-magnetite-pyrite veins. Anomalous tungsten occurs at the prospect although no scheelite was identified. One rock sample returned 264ppm W and high W values (45 – 700ppm) in soils form an anomalous halo around the Au mineralisation. – A 2.5km x 2.5km >2ppb Au anomaly that encompasses the Ti-Tree breccia area. – A 150m long zone, ranging from 4m to 26m wide, of highly anomalous Au in rock chip samples. Within this zone a higher grade area of 26 x 14m averaged 3.5ppm Au. Although previous explorers have conducted dedicated exploration programs over the Ti-Tree breccia area, the drilling programs have been shallow (<155m depth). In 2007 Newcrest planned to test Au-anomalous rhyolite breccia at the Ti-Tree prospect with a 350m – 500m hole below the surface expression of the breccia. Newcrest relinquished the ground before this hole could be drilled. This prospect is located approximately 600m north of the Comstock breccia deposit and was identified during ActivEX prospecting. It is located in a previously unrecognised/unmapped intrusion and comprises an area of altered porphyritic felsic intrusion with nearby rhyolite dykes. – Gossanous quartz veins in a highly ferruginous quartz-feldspar phyric intrusion with pink feldspars and greenish matrix; local hematite fragments. – Ferruginous, gossanous and magnetic breccia within the area of felsic intrusion. This is a grassroots prospect but it has several characteristics that suggests it warrants further investigation including a felsic intrusion, alteration with locally intense hematite, brecciation with magnetite, and anomalous Au, Ag and W.
The area encompassed by EPM 18615 hosts numerous occurrences of anomalous gold, locally associated with anomalous silver and/or base metals. Several companies have conducted exploration programs within the tenement area; ActivEX exploration activities have comprised a desktop review and reconnaissance traversing and prospect assessment. This is an area with several historical gold workings. The most extensive modern exploration carried out in this area was by Balmoral Resources in the 1980’s. Exploration included geology and alteration grid mapping over the Mountain Maid and Homeward Bound area – covering approximately 3.5km x 2km. The central part is highly anomalous in Au and Ag in drainage samples. Historical production from this deposit was 200oz Au from 159t. Local geology comprises schist intruded by Digger Creek Granite (pegmatite) and cross-cut by Permo-Carboniferous rhyolite porphyry dykes. The best developed workings follow porphyry contacts. The material mined at Mountain Maid appears to have been sub-horizontal quartz-sulphide veins. Newcrest (1997) concluded that bulk tonnage potential lies within small stockwork quartz veins with strong local sericite alteration, which may extend beyond the limits of previous mining and possibly under recent alluvial cover to the north. The Josephine deposit was mined by Eltin Minerals in the 1990s and produced 65,000t @ 4.1g/t Au and is currently held under mining lease applications (not ActivEX). The deposit also contained sub-economic Cu and Pb. Mineralisation is hosted in gently dipping veins in Proterozoic metasediments, with hematite and pyrite the main gangue minerals. Deep soil sampling and drilling by Eltin and Kidston Gold Mines identified two elongate anomalies along strike to the east and west of the Josephine. Drilling on the Eastern anomaly intersected poorly developed weak mineralisation. Drilling on the Western anomaly encountered encouraging grades at depth. No further information is available in open file reports; it is not known if Eltin subsequently carried out further exploration on the Eastern and Western anomalies. Within the Mount Hogan mine area there are several Au and U prospects in and around the Mount Hogan Granite. While some prospects within the immediate vicinity of the Mount Hogan pit are held under mining lease, most are within the ActivEX exploration tenement. This is an area with prospective geophysical and geochemical features that has not undergone any substantial exploration. Several sieved samples (mesh unknown) with values from 60 to 140ppb Au. EPM 19207 covers an area of Proterozoic Bernecker Creek Formation Metasediments with minor Cobbold Metadolerite. The regional aeromagnetics suggest this area is more complex than indicated by the regional mapping, with several intersecting northwest, east-northeast and east-west linear magnetic features. There are no known mineral occurrences, however stream sediment sampling by Kidston Gold Mines located anomalous Au in BCL stream sediment samples, with values from 26.1 to 51.8ppb Au. 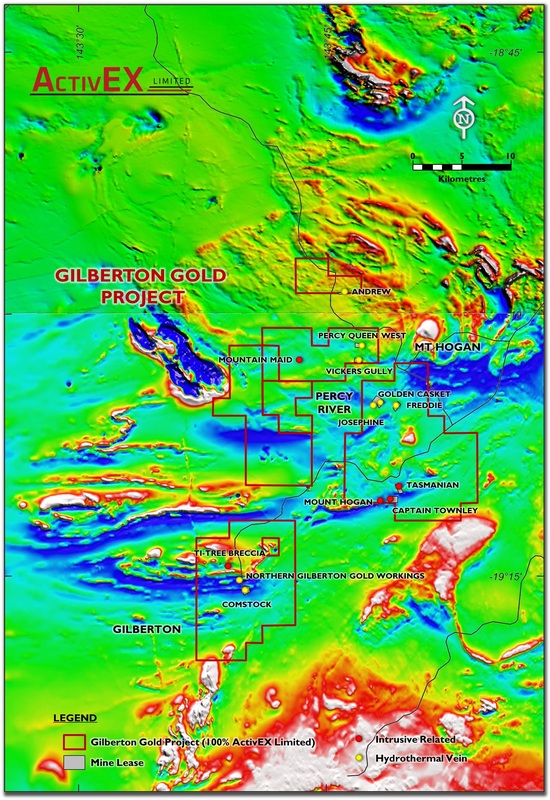 The Gilberton Gold Project is located in the Georgetown Province, approximately 300km west-northwest of Townsville. The Project consists of 3 granted EPMs that cover a total of 464 sq. km. The Gilberton Gold Project is located in an area that is prospective for a number of metals and a wide range of deposit styles. Exploration targets include intrusion/porphyry-related Au, Ag, W, Bi, and Mo, and possible IOCG-related mineralisation. Multiple centres of alteration associated with veining, brecciation and anomalous metals have been identified.